Tamara O’Neal was an emergency room doctor at Mercy Hospital known for her dedication and faith. Chicago police Officer Samuel Jimenez joined the department last year and only completed his mandatory probationary period in August. Dayna Less was an Indiana native and 2018 Purdue University graduate who had just begun a pharmacy residency at Mercy in July. 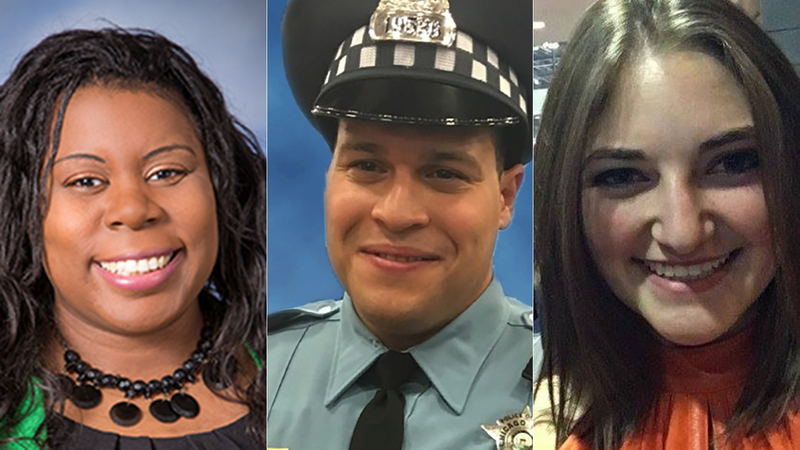 All three were killed Monday afternoon in a mass shooting that began as a domestic argument in a parking lot outside the Bronzeville hospital before it spilled inside. Jimenez, 28, worked in the Chicago Police Department’s 2nd District after joining the force in February 2017. He was married with three children and completed his 18-month probationary period required of all new officers just this summer. He and his partner were not assigned to Mercy when the shooting erupted but arrived at the scene and pursued the gunman inside where they exchanged gunfire in the hospital’s lobby. It was there that Jimenez was fatally struck. Jimenez was taken to the University of Chicago trauma center. At 7:30 p.m. Monday, CPD spokesman Anthony Guglielmi tweeted word of Jimenez’s death. Chicago Fraternal Order of Police President Kevin Graham called Jimenez a “valued brother” and “courageous police officer” who gave up his life protecting the city. Jimenez’s body was surrounded by Chicago-area law enforcement in a procession Monday night to the Cook County Morgue. He was the second Chicago officer killed in the line of duty this year after Cmdr. Paul Bauer was gunned down outside the Thompson Center in February. “Just the best person ever, really,” Patrick Connor, who heads up Mercy’s emergency medical department, told reporters. The suspected gunman, 32-year-old Juan Lopez, was O’Neal’s former fiancé. He shot her multiple times following an argument in the Mercy parking lot before firing on arriving officers and moving inside the hospital. Less, 25, had just stepped off an elevator on the first floor when she too was shot and killed. Less was born in Saint John, Indiana, and graduated from Purdue with a degree in pharmacy. She was engaged to her high school sweetheart and planned to marry next June. She graduated Lake Central High School and graduated from Purdue’s pharmacy program in May after six years, according to her father Brian. Like Less, O’Neal was also a Purdue alum, graduating in 2002. Lopez also died Monday. Autopsy reports show Lopez sustained a gunshot wound in his abdomen and a self-inflicted gunshot wound to his head, according to the Cook County Medical Examiner’s office. Jimenez died from a gunshot wound to the neck, while both Less and O’Neal suffered multiple gunshot wounds.